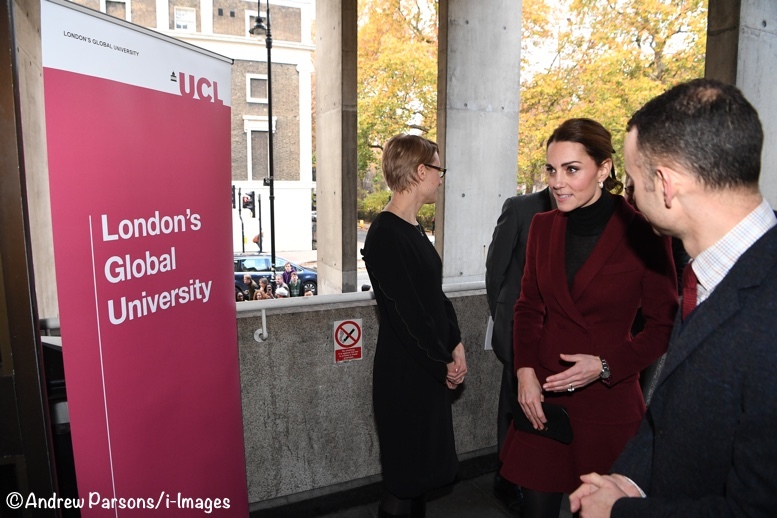 The Duchess brought back a Paule Ka suit for today’s engagement at University College London (UCL). She was at the University to visit its Neuroscience lab. 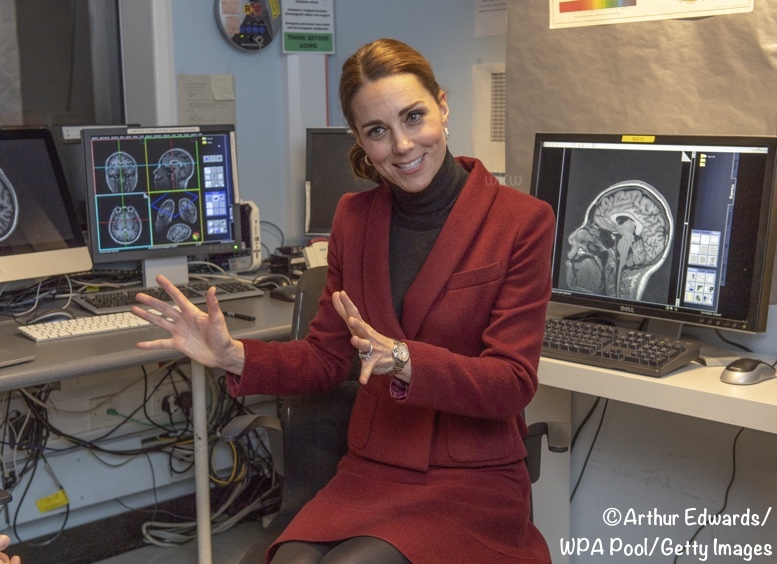 Kate met with a team of research neuroscientists. Richard Palmer shared a video. 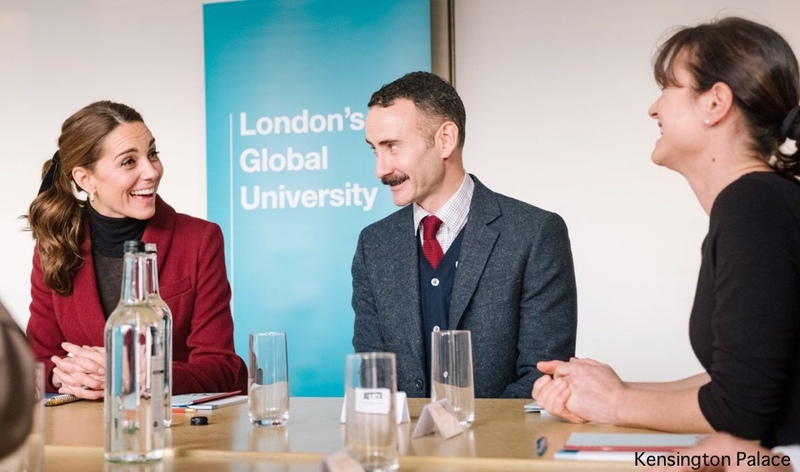 Kate also took part in a roundtable meeting with researchers and students. Now for our look at what Kate wore today, starting with her Paule Ka separates. The jacket is double-breasted; it features a shawl collar, two front patch pockets, a slanted breast pocket and modified peplum detailing at the waist. The skirt’s most distinctive feature is its three tiers. Kate previously wore the suit in October 2012 for a Middle Temple engagement, and again in February 2017 for an away day in Wales. This may actually be the fourth wearing; there is some thought the Duchess wore it for the Queen’s annual Christmas lunch at Buckingham Palace in December 2011. Photos may be seen here. And brought back her Tod’s suede pumps. The Duchess wore her hair pulled back and tied with a velvet ribbon. On a related note, the Duchess of Sussex also had an engagement today. She also wore burgundy. There’s been chatter about this online, debate about whether or not it was planned. I believe it was. Both women are sure to have heard about or read the stories in the tabloids about their hypothetical arguments, the fights they are allegedly having, all manner of things. Both are well aware of the unspoken messages their wardrobes send, and both are savvy enough to connect and say, “Hey, next time we have engagements on the same day, do you want to wear the same color or do something else to send a message?” Call me crazy, but I don’t believe it is coincidental they both wore berry/maroon clothing, both wore black tights and both wore ponytails on the first day in quite a while when they both had engagements. If so inclined, you can read about Meghan’s outfit at our sister site, What Meghan Wore. Also today, a quick retail note: Monica Vinader has started its Black Friday promotion early, offering 30% off *all* collections. 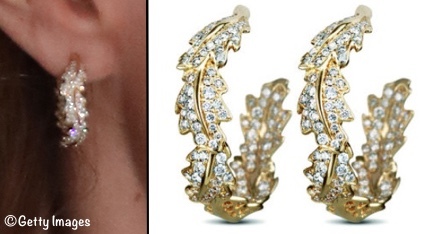 This includes Kate’s Siren earrings. Normally priced at $195, the earrings are now $136.50. For everyone celebrating tomorrow, I hope you have a splendid Thanksgiving! We’ll see you Friday with our annual list of shopping Sales & Savings opportunities! Gobble-gobble. Oof sorry to say there is nothing to like about this look. I even showed it to my mom asking “What do you think?” and her first comment was how outdated it looks. 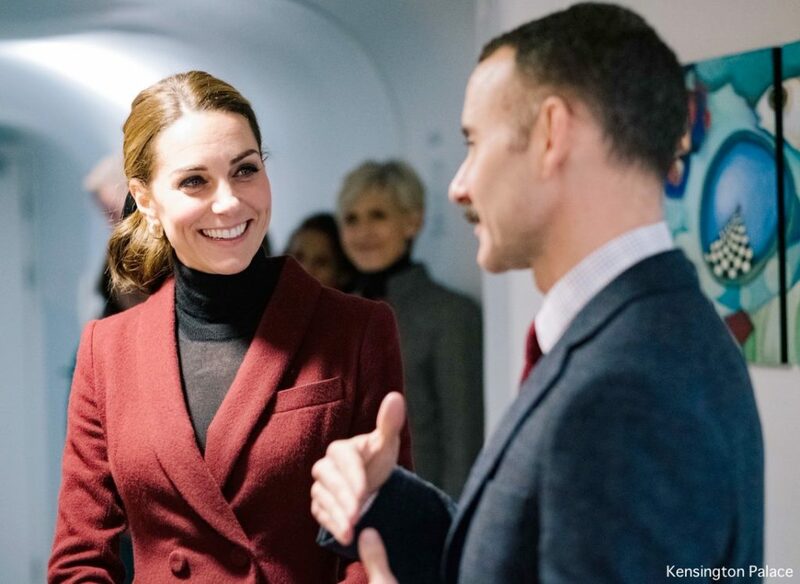 Burgundy is a fine color on Kate but that blazer looks a bit too snug. And the skirt isn’t necessarily too short but it looks like something cutesy I would have worn in college or high school. Kate looks like an intern here not a 30 something year old woman. Time to donate this outfit to the Goodwill. I am generally a big fan of Kate and her beautiful fashions. I like the fact that she has been re-wearing some of her lovely classic clothes like that gorgeous teal Jenny Packham gown. More of that, please! However, Kate needs to get rid of this entire burgundy outfit and never wear it again.. This mess needs to go to Goodwill. The color is not flattering on her at all, the skirt is much too short. Short skirts like this are no longer in style. Also the awful bland black turtleneck makes it even worse. This outfit might have been salvaged for a younger woman with over the knee boots and an on trend ruffly, lacy blouse. The whole look is thrown together, not flattering and needs to leave Kate’s wardrobe forthwith. She has so many lovely coats and suits I cannot imagine why on earth she would wear this hot mess of an ensemble. She really does have an amazing figure and this six year old outfit definitely shows it off. I love that she and Meghan color coordinated for this day out at different events. The ribbon goes well with the overall look. It’s nice to see her try something new. I forgot to add, I love her new earrings!!! I think the coordinating outfits were a coincidence. This time of year, burgandy and black tights are not hard to come by. If anything, I would be concerned about inviting a “who wore it better” showdown. Love love love the coordinating outfits between the two duchesses. I definitely agree that they’re making an unspoken statement that they are, in fact, quite close. I agree with others here though that the proportions are off for the Duchess of Cambridge. The skirt is too short and flared for me. A pencil cut a few inches longer I think would have worked better on her slender frame. As it is, it looks like she’s wearing a triangle instead of a skirt. I too love the coordinating of the day’s outfits ! She would look on point and elegant in a pencil skirt which she rarely seems to wear! Love the pony tail and turtle neck. The suit itself is super on trend, including the skirt. Kudos to her for being ahead of that. In tweed right now, the look is particularly popular, it’s just not a trend I’m into. Tiers are kind of awkward looking in just a skirt, but there are also probably distinctions between how this looks photographed vs in person. I think it is a perfect look overall for the occasion, and people should be able to have a good time playing with trends even if it doesn’t work quite exactly as imagined. My preference might have been for a black turtleneck sweater dress or a green sweater wrap dress, of that Ralph Lauren sweater dress but all of those might be decried too casual. A Christmassy Suit was a wise choice to start the holiday season’s appointments. Ps. 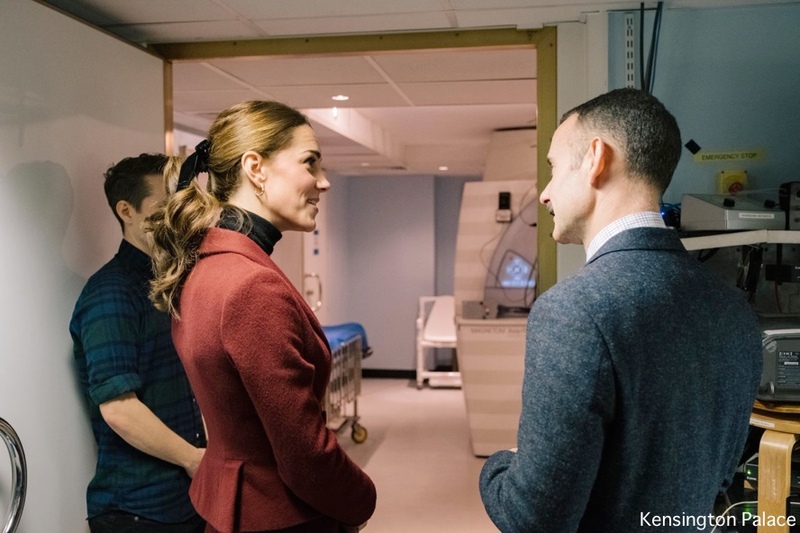 I really love how engaged the Duchess is and how she is exhibiting to the people that she is so thrilled to be there and learn what they are working on. You can see her genuine interest and their happiness in having their work recognized. Truthfully, that was what I focused on until reading the comments. STILL do not find anything positive about this outfit. Also I did not like anything about this suit the first time she wore it. Love the pumps though. Seems to be ill-fitting and too short. I couldn’t have stated this better. I’m not sure what her obsession is with too-short skirts that look too frilly like they would be better suited for a 5 year old. I do like the turtleneck with the blazer, though the blazer seems too short. I do like her new earrings, bringing back some homage to the acorn/oak in her coat of arms. Agreed 100%! That bow, scrunchy thing made me shudder! An interesting choice of look. The overall result is youthful. Not something I would wear together but Intersting combination to try. The stocking seems to be grey. She also seems to be more animated, and there is something different with her makeup. On the wardrobe coordination – that’s too far fetched. Their assistants might try it but the Duchesses themselves would not like to be seen as appeasing gossip (or even that they heed gossip). The proportions do look slightly off to me, which is weird, because in previous appearance of this suit that’s never struck me as a problem. I have to think it’s because her hair is up this time. That’s no knock on the ponytail–NEVER–but just an observation that somehow the changing hairdo seems to change the proportions of the suit. I do prefer it with the hair down. I love these Tods pumps and remember that there was a phase where she was wearing them almost constantly–early days pregnant with Louis, maybe? I want them as much as ever. Speaking of ponytails, your sales alert about the earrings gave us a wonderful moment to reflect on a near-perfect deployment of the royal ponytail, and it reminded me of that beautiful green silk dress with the white floral pattern. It was NOT a favorite on this site, but to me she was at her most beautiful in it. I was happy to see it again, and I hope we see it again on the Duchess sometime. Agree, agree, agree. With both of you. This is actually one of my very favorite out fits when she wore it in 2017. (Let’s not even get into the shoes because I’ve had to have said at least five times I need these shoes on this site. I really need them). I remember very distinctly the term “sqwosh short” was used the last time she wore it. Lol. And I’m going to say what I said that time around…. It’s why I love it, it really is! I like to think of people telling her it’s too short as she walks out the door and her ignoring them. It’s like the fashion choice is a window into her personality. And hands down they color coordinated their outfits….love it and the messages it sends. AND I agree with you Jessica…..it’s just not quite as flattering as the 2017 timeout could very well be the hair, but her pony tails are awesome…. and that pony tail from the green tea dress, is one of my all time favorite. I was in the minority, I wanted to exactly copy that look! I loved that dress. I thought about buying it. Some of my favorite items are all on this post and I so agree with both of you. I loved that dress, too! And her hairstyle… She has such beautiful hair. It’s too bad she has shifted away from styles worn in the past. Sigh. This seems like a good time to applaud Susan, who prints all comments that fall within her guidelines, even ones such as “Meghan looks chicer than Kate” and “Could Kate buy Meghan’s shoes next time?” while knowing that this is a Kate fan site and that most of her readers come here because they love Kate and think she already looks fantastic 99% of the time. And yes, we might have members of the royal family that we take to more than others, because we are royal watchers and we form impressions of them as we see them go about their duties. And really, we don’t know if the duchesses are close– we don’t know if they are friends, or ultimately just two very different women who wound up in the same high-profile family. I think that like Kate, Meghan is beautiful, stylish, and has great hair. But I am not a fan of the constant messy updos. Sometimes the messy bun or ponytail is appropriate and goes well with the outfit. But here, like at other times, it spoils an otherwise great, and, well, very expensive look. She looks better in this suit each time she wears it, and the shoes are perfect. Happy Thanksgiving to our intrepid and determined administrator. Kate looks great – young and genuinely happy. She has very much looked like a future Queen in her last few outings, so this is a nice changeup. She may be a future Queen but she is still a young beautiful woman. Tired of the either too young or too old criticism. I think the ponytail matches the youthful feel of this suit. I tend not to like black turtlenecks with skirt suits – a v blouse might have been a better choice. The tights and block heels are perfect. I agree with another commenter about sheer black hose that MM is wearing. That is a look that is both formal and older. It would not have worked with Kate’s outfit. 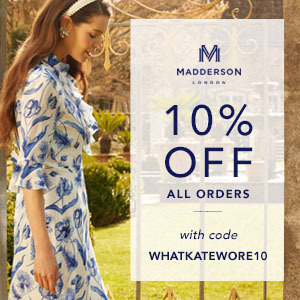 I hope this site is not going to include a lot of comments on MM’s wardrobe – there is another site for that. However, I’m rather amused by the comments – I suspect if Kate wore something like that she would be criticized. The girlish almost Peter Pan velvet collar seems at odds with the sophisticated bootie, the effect of which is undercut by the sheer black hose. The sheer black hose is a drag on the colours of the dress and the coat . The heavy oversized coat overwhelms the dress and MM. I know she is pregnant, but the entire outfit is rather shapeless. One final comment. There are a lot of remarks about things not being “current” enough or looking like another decade. I hope woman of any age have to freedom to wear their skirts at a length they enjoy and look good in without being told that’s its no longer in what male designers have decided is this year’s “fashion”. 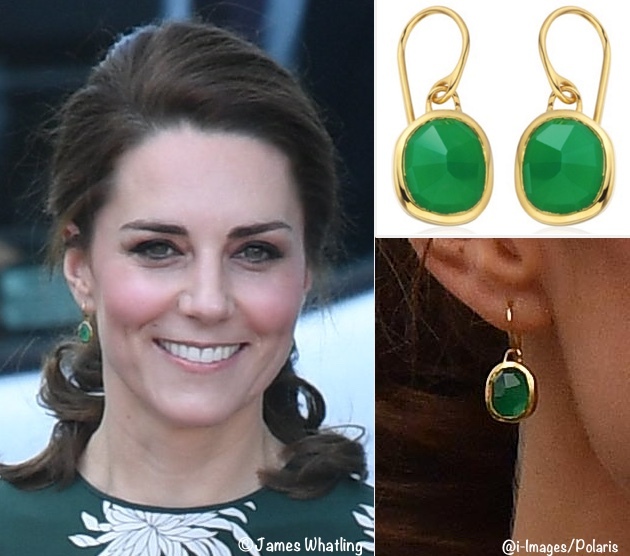 There was a comment about Kate’s earrings on Remembrance Day looking like the “80s”. Actually they looked like the 40s and a wonderful nod to the war years that many in the services – including the Queen – would remember. They also echoed the cluster of poppies. Lovely. I agree with everything you wrote other than thinking the turtleneck is a more uncluttered look with this suit. In my own post I commented about the too old too young criticisms being tiresome & think strongly we should be able to wear our skirts & hair however we choose at any age. Blessed with poreless skin without a wrinkle, at 68 I’m often mistaken for 40. I wear “youthful” clothes & still have long hair. When it’s no longer becoming, I hope I have the sense to make appropriate changes. Kate may be a future Queen, but believe she should have the freedom to dress as other professional women dress & not be tied to a dress code defined by society. If she does have a dress code, it should come from her boss, the Queen, just as other working women may have dress codes at work. I enjoy seeing her dressed as other 36 year old women may dress for work & not be tied to strict formality. I especially dislike seeing her almost always wearing 4” stilettos since they will result in foot & back problems not many years down the road. I don’t see other women her age wearing those foot killers day after day, so I’m always pleased to see her wearing her few block heeled shoes. I had an unfavorable comment about MM’s attire removed by the editor a while back, so have remained silent on that subject ever since. I’m going to risk stating I agree with your comments about her attire. So, I think this suit has had it’s day and possibly could be split to reimagine the jacket with a neat pair of wide-legged trousers. The length of the skirt and tiers dates it. I love a pony tail, but prefer a side part for the lovely duchess with a pony. The shoes are stellar tho, and a chunky block heel is just great! Expectant duchess looked lovely, the bootie was modern perfection! Again, a titch more length on the dress preferred. I tend to agree with you Claudia. I love suits and would like to see Kate in them more often. And I’m happy to see another repeat, though I was hoping it was not going to be this particular suit. While I like the jacket, I have always found the skirt to be too short and girlish – just not very professional in my mind. Love the shoes and glad not to see stilettos. While I have been eagerly awaiting a ponytail, this one is too low and flat imho. Her hair looks too severe in the front – it needs more volume or lift and I would be happy to see her ditch the hair bow. It doesn’t complement the suit. I think I like her hairstyle best for the second outing of this suit. I love the half back look- her lovely face is clearly visible rather than bothered by loose hair, and the styling at the crown shows a lovely soft lift. block heeled shoes work well with the suit. Agreed! This outfit needs to be retired. Hmm, I want to love Kate’s look today, but the proportions of the suit feel off. Not sure if the jacket is too high for the skirt (might be bustier due to baby), so it hits her a little higher? or if the skirt is too short, but I am not loving this. I think the ponytail is cute, but her hair looks so much lighter! I prefer a little more of the warmer chestnut color on Kate. As for the outfit, it feels not right. As someone mentioned, maybe trousers or jeans with the jacket would be better. Otherwise, Kate looks happy and relaxed, which I am here for. Thank you, admin, for all your hard work! I hit your site daily, even on American holidays. It’s a joy to read about Kate. I think it almost looks like the outfit shrunk in the wash. It seems to fit oddly for sure. This suit looks like it was great for a young woman in 2009, and I wouldn’t be surprised if it was purchased around then by a mid-20s Kate Middleton. I agree with others that it could now be retired, as the silhouette is outdated and a tad young to look elegant or sophisticated. I like the bow in the pony tail. Hope we see a more successful execution of the same hairstyle with a future outfit. Thanks for showing the comparison with MM, very interesting! Meghan’s outfit looked like it could be borrowed right from Kate’s closet. I love to see things about both of them so I appreciate the occasional highlights of MM and other female family members. No one complains in the comments when Sophie is the Queen are covered so I find the unhappiness to be baffling. Almost as if there’s something about Meghan herself that is dislikable. Can we have a moment to appreciate her legs!! She’s had 3 kids and still looks amazing. Better than all thev18 year olds I can think of. I love black tights and those shoes are some of my favorites. Those who mentioned her looking older: years of sun exposure and a stressful job will do that. She looks fantastic!! This outfit makes her body look so oddly proportioned. The jacket looked so much nicer w a blouse- I think it made the jacket’s styling seem ladylike and pretty where the severe black turtleneck makes it look shrunken and prissy. I do love the shoes especially w opaque hose! I think I like the 2012 styling of this suit the best. Maybe it was the hairstyle then, it just seemed fresh and classic Kate. I think this jacket would be super cute with black trousers though. And I love the ribbon in the ponytail, is it velvet? I agree, I belive the Duchesses coordinated and are aware of the silly reports of drama within the family. Kate has always seemed diplomatic with her fashion, Im sure this is their subtle way of showing a united front through their clothing choices to say ‘we’re good, everybody chill’. I love this short fitted suit. My head spins with comments that outfits are dowdy & too matronly then she is criticized for wearing something youthful with a kick in it. She has a terrific figure that seems to get better every year & I love it when she puts it on display. Her legs are muscled & as shapely as a dancer’s. The heavier legging with black suede heels that aren’t stilettos for a change creates a streamlined look with shoes & leggings one long length. The short circle skirt is cute & “fliippy” looking like she could be doing spins in black ice skates. The fitted jacket also showcases her enviable body with a defined waist. She has a long neck that allow turtle necks to fit without a wrinkle & I much prefer her hair off her face in any style. The pony tail & black ribbon make up a perfect look in my eyes. She looks so pretty & happy I can smile just thinking of how “zippy” she appears. Who decides what is a Princess Look? Her straight back & shoulders lend elegance & confidence to her bearing which I would define as a Princess look. Her sculpted toned body is a photo of health & exercise. Her smile is welcoming. In my opinion, this suit is in style unless midi & maxi lengths, a return to the ‘30s, are all anyone wears. Short skirts are in style & she’s got the figure & posture to carry it off. I think she looks darling & every piece works together such that she could be a mannequin in a holiday display window. I wish she could sneak in a couple of skips to complete the happy youthful look. I can’t believe I have missed this ensemble in previous engagements! I love it! She looks so young. I like that she even wore this despite the longer hem lines lately! There is nothing tired or dated about this suit! I would like to echo some of your previous followers in saying your blog is THE FIRST blog I check in the morning while I drink my coffee. Throwing a little “thankfulness” your way and hoping you have a wonderful day and thank you for all you do! Kate looks good. Nice tights with short skirt to keep her warm. I always like it when her hair is away from her face. Thank you for this blog! I enjoy following Kate’s style – and reading about the excellent causes she works to support. Might be an unpopular view but my issue here is not with the ensemble but with the hair. I agree that it was a youthful burgundy set when worn back in 2012 and she was a young married woman then. But I had no issue in 2017 with her hair being in locks. It might have seemed a bit dated (most likely because we knew it was old) but not juvenile. This time around a see a young woman (or I should say a youthful body) which is aged due to the hair. Each one on it’s own is wonderful. But I wouldn’t have them together if I had the chance. I definitely would like to see her again in this kind of pony tale with a ribbon. Maybe with one of her dresses without a colar or with one of her white blouses. But unfortunately it is a miss for me this time with this ensemble. I had a similar suit a while ago which I wore for many years and would still wear today if it fitted properly so I have no problem with Kate wearing a suit she’s had a few years. Its her style and suits her. I like it with block heels and a pony tail and a classic polo beneath. Its a timeless look which she can bring out without having to spend ages thinking about what to wear. I approve!! I like the idea that Meghan and Kate choose the same colour to send a message. I would imagine each is delighted to have the other and they will be hugely supportive of each other. They are sensible, grown women who I would think would prefer to be allies rather than rivals. I’ll get information from these sites about what they wear rather than read tabloid tittle tattle I think – its much more uplifting!!! Thank you for your all your work and Happy Thanksgiving! Definitely agree that this suit needs to be retired. More importantly black tights and pumps are not a good look at all. Sheer hose ( like Meghan’s) are much chicer. Tights are fine with boots. Together with the black velvet hair ribbon, Kate did not look like a princess today. Hm. Where I live (East Coast) and in my age group (30s), tights are much preferred and sheer hose is very 80s and dated. I don’t know a single woman my age that wears hose. And as I’m a lawyer, I know a lot of professional women who wear skirts and dresses. I adore the pumps. She looks like a Barbie with this outfit and I like it. I don’t think there is a coordination between Kate and Meghan especially when they are on separate occasions. As readers of this fabulous site, we tend to think they are very aware of each other’s actions but in real life it seems unlikely. They have individual lives, schedules and programs. Kate is a mother of three, an experienced Duchess and her position in the royal family superior than any other young female royals. Megan is a candidate mom and a former actress, also a newcomer to the royal family and royalty culture as an American. As of now, they are not best friends to each other, but in the future, they might be who knows:) So, it is only to entertain ourselves when we think they send messages to each other, to the universe or to the memory of Princess (for me she is always) Diana when they chose their outfits. Though a coordination makes sense when they will attend the same occasion undoubtedly. Skirt length isn’t so much the issue as the silhouette. The short circle skirt style in a thick fabric is what makes it look dated. A-line would work much better in that length. The awkwardness is magnified by the shrunken double-breasted peplum jacket. Short shrunken jackets were more ‘in’ a few years ago. The turtleneck does it no favors. It was a beautiful suit when it was in style, I’d second comments about wearing the pieces as separates or just mothballing the suit for a while. I don’t believe in any rules about age and skirt length, but overall silhouette and balancing short and long, full and sleek is essential at any age. A rare miss for the Duchess. Wow this outfit really brought readers out. I wonder if it’s just My computer screen or is her hair much more red in hue? All I have to say is she is amazing in the ability to have 3 healthy children and still wear clothes from way back. Always a joy to see her choices. After being pregnant it must feel good to wear short swaying skirts and fitted blazers with sweaters. I do agree I live her in ponytails but this one needed a bit more height. I think Kate’s look today looked like a “Business Princess”. I liked it. She has a gorgeous figure after 3 children and her smile and interaction with those around her makes her even more beautiful. Perhaps a softer material black blouse would have made for a less severe look. Warm undergarments can easily solve the cold issue. I would love to have a glimpse of her closet – just to see how her wardrobe is managed! Kate does seem to have darker rings under her eyes which makes it appear as if she is tired. To be expected with a 6 month old and 2 young children, However, she strikes me as a very hands on Mom despite having help. The fact that she is still doing her engagements despite perhaps feeling tired makes her more real and “one of us” – faced with many of the same challenges as working mothers across the globe face. I think she is a real asset to the Royal Family and look forward to reading your fantastic posts about her engagements and clothes Susan. Thank-you for this super site – it is the first site I open every morning! Here is SA there is not much news about the Royals, so I eagerly devour your posts. Looking forward to Kate’s next engagement. I actually quite like this look! I’m a fan of preppier styles and burgundy is a great color on her. I was so happy to finally see a ponytail! I hope she wears her hair like that more often. I have really enjoyed seeing all of Kate’s repeats lately…with the exception of this one. If memory serves me correctly, when she wore this suit in 2017 many of us said it needed to be retired. I find it to be dated, too short and juvenile. The black tights do lend a touch of modesty over bare legs, but to me, this skirt is too short for a woman in her position. The research being done by the neuroscientists is absolutely fascinating and will lead to great benefits for children and their families. I love those SIren earrings. I enjoyed her whole Chelsea Flower Show look. I’m looking forward to her attendance next year! 1. I love when she recycles looks, but this suit is outdated. The colour is lovely but the fit is not. She has lots of other suits in her closet that would have been a lovely re wear! 2. I actually really like the turtleneck look… but not under a blazer. Again, very outdated (she has done this before). A turtleneck with a skirt would have been great. 3. She suits a ponytail SO well, but today hers lacked volume. Compare to the pic at the bottom of the page… ponies are beautiful with the right amount of backcombing. Today her hair was just pulled back too tight. I’m indifferent about the bow. 4. I’m a big fan of the shoes (maybe not with the outfit) but they are a great fall/winter heel!!! I’d love some volume in her ponytail to make it look a little more intentional rather than a rushed hair style. The jacket just doesn’t fit well around her narrow hips for my liking. It looks it sticks out, not enough to be peplum and not fitted enough. I have always disliked this suit. Dated-looking and too short of a skirt for a suit. I’m also not a fan of the Tod’s pumps. But love the ponytail and ribbon. So fun and fresh. Like the pieces individually, but just not all together. Think jacket and turtleneck would have looked good with a slim fit pant. Or skirt with a more substantial jacket. Don’t mind the velvet hair tie, but with the short flinch skirt, together seemed too young. Kudos that she shows recycling pieces, just would prefer as separates. Not a fan of her tights, whatever brand. They always seem to have a hue of navy. Need a real solid opague true black. She also has cute booties that would have been a better choice. I liked the brief comment on MM since the outfits on same day had so many similarities. Breif to acknowledge, not not too much as it is covered well in whatmeghanwore site. Kudos. Am I allowed to say I very much liked Meghan’s look? Agree with you about her tights. Whenever she wears them with these Tod pumps they just don’t look right. I think Duchess Kate looks great and even though she has beautiful hair and I love seeing it, I am beginning to like her hair pulled back away from her face. Just a nice look. I will be an outlier here and say that I actually have always really liked this suit, and it is on trend now due to the color (actually, I am usually an outlier, in that I hate all of Kate’s boring McQueen coats and suits when everyone loves them, so I guess it makes sense I love something everyone else hates, heh). And i love the earrings. But the hair ribbon has to go. Also love Meghan’s burgundy ensemble and her boots. I think youthful is the perfect word to describe the suit. Kate looks fine but I think she’s outgrown this particular suit. It is nice to see her though in separates for a change rather than a dress. In terms of the Duchesses coordinating, I’m not sure what to think. Sophie, Countess of Wessex also wore a sheath dress with black tights yesterday so maybe Meghan was following her lead. And burgundy is a popular Fall color. But on the other hand, the Queen has been said to send messages by which broach she chooses to wear. Like the suit and don’t think it looks too dated or too young. It’s a fun change up from her more classic and regal looks, which I love, and a reminder of the newly minted Duchess. I particularly like the tiered skirt. I don’t know why a black turtleneck would look severe. They’re classic. Most of all, I really don’t know what to say to those who are accusing her of matronly-granny-bedspreads and the next minute chastising her for looking too youthful, and wearing a skirt a few inches above her knees. Which is it? Granny-matron, or 20 something? The level of nitpicking is very dispiriting sometimes. She’s not a specimen splayed on a slide under a microscope. It’s not a question of airing likes and dislikes of Kate’s choices, but of holding her to an impossible standard for anyone to meet. Here, here! I agree. Moving her all the way from one side of the fashion pendulum to the other really isn’t a fair assessment. She must like this suit. So she wears it when she feels like it; good for her. I’ve worn a favourite outfit past what others may say is past it’s due date but that’s ok. Lots of worse things could happen. Most importantly she’s out there time and again supporting the causes she does with obvious enthusiasm and outward joy. I like her outfit and the colour is on trend which says to me she knows how to pick her clothes to remain on current over time so it’s possible to get more than one wearing. This is the new Royal trend and I think it’s great. Thank you! I totally agree with everything you just wrote. I know this is a fashion site and maybe people feel like they can pick apart her outfit and be nit picky and opinionated about her fashion choices, however, I personally find it annoying. I feel bad for Kate – the level of scrutiny is through the roof and I find the comments quite shallow. Oh the skirt is too short, hair pulled back too tight, the tights and shoes look weird – I mean, c’mon! Kate looks FABULOUS – more fabulous than probably most of us commenting on this site. I don’t always love her outfit but she still looks great to me. Nit picky = negativity in my opinion. Due respect, nit picky doesn’t necessarily = negativity. If commenters aren’t detailed (read nit picky) in our comments, there wouldn’t be much to the comment section except vague generalizations. As pretty much a non-fashion person, I enjoy reading the discussions on hemlines, button holes, what difference the location of a seam makes or how a pleat impacts the look of a skirt….things that would just not occur to me. The one thing that is a bit creepy to me is when photos taken through car windows are blown up to examine the lace on the strap of Catherine’s gown or some such thing….borders a bit on voyeurism. Ditto to your entire comment!! I have become much more aware of nuances in fashion since beginning to follow this blog and its comments and it affects my shopping choices – for the better, I hope! This would not have happened if not for the detailed discussions. Burgundy and black!! What a wonderful combination! She looks so great in burgundy! Perhaps her best color. I think the overall look is a bit young. I like the hair, but the skirt should have been longer. Had that been the case and the jacket a bit looser and a tad longer, the look would have been perfect. Can we comment on Meghan’s look? I usually like Kate’s choices, especially her ‘reruns’ but this one misses the mark on all parts. It reminds me of a college coed outfit, the hemline is too short and juvenile like, and the turtleneck is all wrong. IF one thing could have saved this look perhaps high boots? Wearing the shoe and tights is not at all a pleasing look. And about the matching of MM and Kate’s dress. NO. I doubt that happened. Firstly, I dont’ think MM would take advice…she hasn’t really followed any protocol on dressing, so why would she do this? and secondly, it just seems silly that this is how they would choose to show ‘solidarity’. These are 2 strong women, I don’t think this is where they would focus their energies. I think she looks great all around here, I’ve always liked this suit and I think the ponytail contributes to the fresh, youthful vibe she’s giving off. The color is rich and wonderful on her. The velvet ribbon is a nice nod to the current trend of women of all ages elevating ponytails with chic accessories. Honestly, I wonder sometimes what it would take to make people happy. When Kate wears longer skirts and more mature styles, she’s “matronly” or “dressing like the Queen,” but when she wears something shorter or more youthful she looks “childish” or “juvenile.” It’s really tiresome to see opinions swing back and forth between the two extremes ad nauseam. And to be frank, I think comments about Kate looking old/aging poorly are rude, and have become a favorite jab of people who would pit the two duchesses against each other. Kate is an objectively beautiful woman who looks just fine for her age, but in our botox-loving, youth-obsessed society it seems to be a cardinal sin for a woman to have expression lines when she moves her face. It is not always the same people complaining about opposite issues. I frequently complain about her matronly looks so I love this more modern look. And I don’t think it is childish. It’s not THAT short and she’s wearing tights so I think it is appropriate to her station and her age. In terms of her looking “old,” I think it is more a hazard of presentation rather than her actual face. She favors matte foundation, which is ageing. And I think her lighter highlights are, too…she looks fresher with darker hair. I am two years older than her, so her age doesn’t offend me, obviously. But her hair and makeup could be more flattering. JMHO, but I am a reader of this excellent blog in order to see what KM is wearing. 99% of the time that is just what the readership is given. I confess, I am not at all interested in what MM is wearing and hope her sartorial news will be covered elsewhere. That said, KM is rocking her existing wardrobe and making it look new all the time. Timeless taste, gorgeous gal, elegant princess. Brava. Amy, very well said. They are not a package deal. Duchess Kate is a joy to read about and her wardrobe is inspirational. I really hope that we continue to get Kate and more Kate, and that the focus remains there. Thank you for MM remark. I agree. Really ladies? This blog about Kate hardly mentions Meghan, other than Susan pointing out that they wore similar looks on the same day. It was one photo of Meghan and one comment. Similar appeared on WMW. They are sisters in law. Sometimes they will even be photographed together at the same event. If you aren’t interested in anything Meghan related, then skip over it. It is not necessary for you to point out your disinterest in her. Just realized that I should have addressed this to Arthena and LovesBlue also. What I like about this site is the ability to have a two way dialogue that contain different perspectives when it’s done in a respectful manner. I have not done a full audit of the site; however in the past some commentors have directly included or indirectly eluded to a comparison to Meghan’s fashion decisions or what she would have worn instead of Kate. This time there was a picture and perhaps why there was a fresh round of input and feedback to the site managers. As you have suggested, anyone can skip over content that they don’t consider relevant. The comparison game cannot be won by anyone, and that’s main primary concern for my previous comment. Please do not assume that I am not interested in the many other members of the BRF. I see your point, LovesBlue. But the thread started with Amy Carroll saying, “I am not at all interested in what MM is wearing and hope her sartorial news will be covered elsewhere.” So when you said, “Agree with all of you on this one.” I thought that you meant that you too were not interested in Meghan. As someone else pointed out, sometimes Susan has photos and details about the Queen or Sophie, so why would people have any objection to a photo or comment about Meghan? Please see my comments much further down about the discussion on coordinating colours and the impact of the outfits themselves. The Queen and others are most often commented on when they are part of the same event as Kate. This was not that. Thank you for your post. I can somewhat understand it for group events but for a Kate engagement that has nothing to do with MM I see no reason why she should be on this page when there is a site dedicated to her fashion for those who are interested in her. Agree with all of you on this one. Let’s keep the focus on the DoC. I often wonder if when Kate repeats these older outfits, it is because she comes directly from her parents house and these are items stored there. It just seems coincidental that all items are older recycles. I do think it’s a very youthful look, maybe not befitting her senior role within the family. I’m puzzled by your comment, Liz. Why, when Kate has two residences, and likely staff to oversee her wardrobe, would she store her clothes at her parents’ house? It isn’t like she was living at home and has just been married for a few weeks. I applaud Kate’s proclivity to recycling. (I also applaud her ability to still fit into garments of days of yore — before three children!) However, this garment seriously needs to be retired. 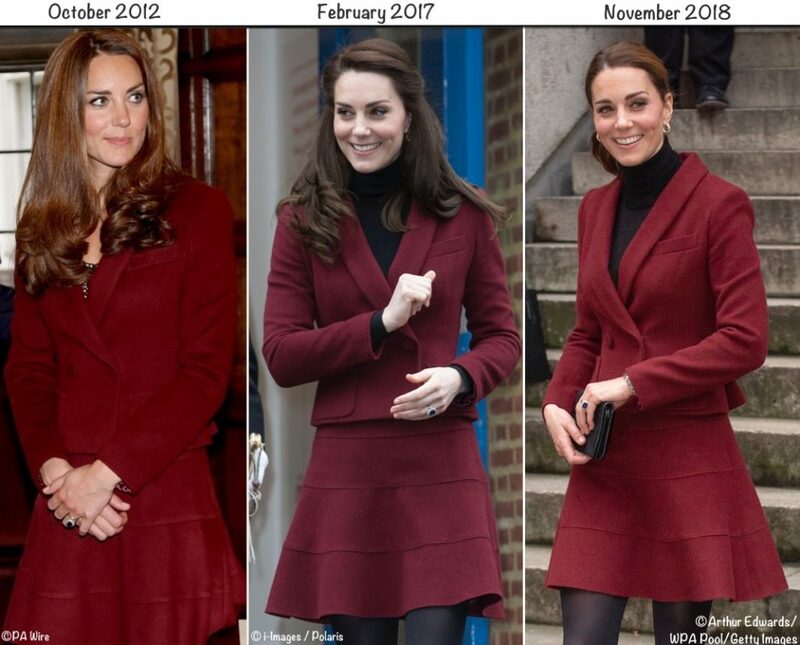 The burgundy is beautiful on Kate, but the addition of the black turtleneck is severe, and the skirt is just too short. Kate has beautiful legs, but I don’t like to see her wear her hemlines too high. It’s not suitable for her position/age. I do love her style, though…I just think she can do better. Love her hair today, and love the ribbon! I hate to say negative things, but I just don’t like the turtleneck look. Every once in a while it is pulled off right, but normally, like today, it just makes for odd looking no-neck photos and makes even the very slim and lovely Kate look a little full in the face. Such a great cause though! 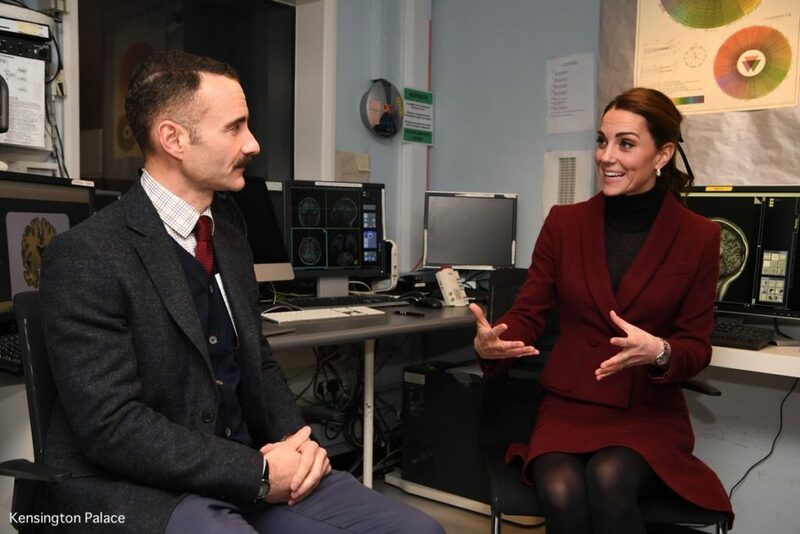 I’m always glad to see Kate and Will focus on mental health. At Will’s event separately today or yesterday he gave such a great speech about it. Nope. Not a fan. Looked great the first time. But that was years ago. She’s too old for this look, especially with that ribbon in her hair. The ribbon is childish. Agree with others, retire the look Kate! You have tons of other fabulous outfits! I’m not a big fan of this Paule Ka, the short flippy skirt is a shade too juvenile and undignified for my tastes – but I thoroughly applaud anyone three decades my junior ignoring all that and going for it anyway! The black tights are an excellent way to offset everything and the jacket is beautifully tailored in its own right with its shawl collar, pocket tabs and self-covered buttons. Those block-heel Tod pumps are spot-on here and I love having a better view of those gorgeous earrings. I’m delighted to see WKW back the collaboration theory about the two maroon outfits today, each worn with pony tail, black tights and black heels. It’s great fun that Kate has differentiated her ponytail with a girlie bow. These two have coordinated before, when they both wore McQueen on the same day, Kate sparkly in Norway and Meghan edgy in black pantsuit back home. And I harboured my own suspicions when they turned up together at Wimbledon, the one wearing stripes while the other rocked spots. It’s just great for them to have such companionship at this level. I think it would be lovely if they actually did coordinate their outfits. Could she buy the same shoes as Meghan for the next time? Her ensemble seems very dated, and maybe some updated shoes would help. The bow is…puzzling to me. It makes the outfit look costume-y, as if she’s dressing up as herself from her university days. Thank you for the heads-up on the Green Siren Monica Vinander earrings. I have long admired them but have resisted until today, when the sale lured me in. They are out of stock and won’t ship until mid-January, a Christmas present to myself! If you are in the US, Nordstrom has them on sale also & they were in stock as of last night. Very worthy cause today for the Duchess so I applaud her for that. The outfit is not flattering, that skirt needs to go. Too short. Not a favorite suit of mine, and the velvet bow makes it look even more collegiate. Pretty color and great cause. And I really like these earrings, so I’m glad to see them again. 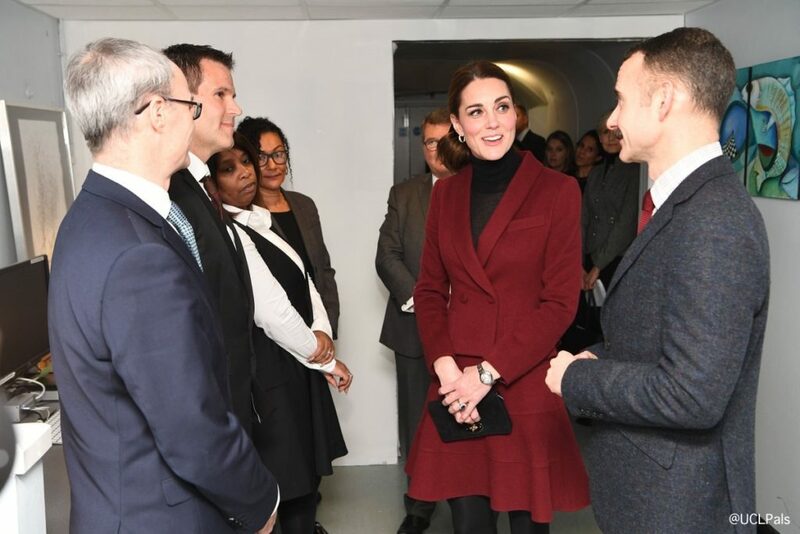 Kate obviously likes this jacket and skirt. It is not any shorter than before, nor is the jacket too tight or the materia too worn. The criticisms,of Kate seem so trite at times. I find it annoying to see a post that criticizes Kate but,heaps praise on Meghan. This is not a post about Meghan. There are other sites that review Meghans clothing. Kate is the future queen and deserves more than banal commentaries. It’s Paula Ka which is great quality and should last years as quality clothes should so why shouldn’t she wear it again? She likes this suit, it fits her the same as it always has and there is nothing worn about the material (particularly confused by this one as I see no evidence of wear in these pictures). There is nothing inappropriate about the length of the skirt and her legs look great! You would think it’s barely skimming her knickers with all this “too short” business. This is actually my favorite wearing of these separates, which I was meh on previously — I think the ponytail is what makes it. The shorter skirt with hair pulled back creates a youthful look rather than the “oops, she probably should have had that retailored” impression I got before, especially the first time she wore this outfit. Up close the earrings look like they might be too flashy for this venue, but not when you see the whole look together. This IMO is a successful “business princess” look and I’m enjoying continuing to see her on a streak of recycling items. Most importantly, she looks happy and energized and is bringing attention to some interesting work being done! I totally agree with that! Great point! I’m going to agree with some of the other comments – this suit should probably be retired. It does’t fit her as well as it used to (totally gets a pass there, she’s had three kids! ), and it’s honestly an outdated silhouette. I’m partial to Kate in a black turtleneck (it makes me feel less old when I wear them! ), but it does look severe. I do like the pony and the velvet ribbon. A fun addition to the whole ensemble. I almost never care about things being “dated,” and it doesn’t bother me much here either, but my love for her choice today goes way beyond whether the look is top notch. It does seem like too many coincidences — of color, tights, the ponytail that Kate doesn’t wear very often — to be a coincidence. The styles are different, yes, and yet what better way for these young women to say that they come from very different earlier lives and have unique styles, but like each other just fine? Along with its color message that tabloid rumors of feuding are untrue, I also note Kate’s short hemline, something Meghan has been criticized for in recent silly stories claiming she dresses “too Hollywood.” The Hollywood-ish accusation is SO very not-true, and has been based on a couple of looks that showed a lot of leg. That additional element makes me think that Kate wanted to give a reminder that short hemlines are mainstream. Nice suit. Nice sign of family warmth. I don’t remember this outfit at all, but love the entire look today! Especially the shorter skirt length. I continue to think either Catherine or her stylist give this site more than a passing glance. Hence the return of the block heels and the pony that several commenters have mentioned of late. Ugh, I really, REALLY don’t like the black turtleneck look under a blazer with the black stockings and shoes. It shouldn’t all be one color underneath. It also does nothing for her. I just don’t understand how she keeps missing the mark. This is not my favourite look. Kate’s hair looks good, although I am not a huge fan of ponytails on adults except for sporty endeavours, the colour combination suits Kate’s colouring, but the whole look seems a bit dated and young. Something you would expect a 20 something to wear. That said, I think the look would have been greatly improved but changing the shoe to either a flat ankle bootie or a pair of over the knee black suede boots again with a flat block heel. Fantastic engagement today. Neuroscience in early development is a fascinating area. It is actually scary when you see how young children’s brains develop and how factors like stress can negatively affect the development of young brains. We often say how relient children are but they are absorbing a lot before they can even talk. I’ve wanted to see a ponytail for ages so I was pleased to see one today and even better with a lovely bow. Big fan of the Paula Ka suit and these shoes which I’m positive are more comfortable and healthier for her feet and back than the hugh heeled pumps. Thumbs up for today’s look. I think some are reading far too much into the similar colours today. These sort of deep reds/burgundy shades are a perfect autumn colour so it’s hardly a surprise they are wearing it at this time of the year. Kate always wears dark tights with this suit and they should both be wearing heavier tights because it was freezing today in London. Frankly, there are far more sensible ways to show “togetherness” than by wearing vaguely similar shades (in the above pic they don’t look similar at all) on the same day. They are two very different women leading completely separate lives and I doubt either of them give any consideration to what the other is wearing or doing with their hair on any given day. Nor should they! I agree on the subject of conferring about wardrobe – I can’t imagine either one of them caring to the point of comparing notes on the subject. BTW, I loved this look today — I know some are saying that it’s too short or the velvet ribbon was too twee, but I thought the whole look was adorable. For what it’s worth, I also thought Meghan looked great today and they both seemed to enjoy their engagements to an enormous degree. I would actually be a little disappointed if this speculation (and that’s what it is) about the outfits was actually true. It would lead me to believe they are actually trying to defend themselves against senseless trash when they have no need to and I would hope they never would. Both of them have far better things to do to coordinate outfit looks and colours. As you say there are many other better ways to demonstrate togetherness in a family. Kate has beautiful legs, but honestly, I think it is too short on her now. Looks so much more appropriate on the earlier wearing when she was younger. Nice to see her out and about. Maybe it’s motherhood or simply genetics, but she really looks much older than her years… Her smile is always lovely, though, and her manner professional and engaged. Happy Thanksgiving to all who celebrate it! This is a lovely color on Kate, but the silhouette seems a bit outdated and the black turtleneck underneath makes her look a bit severe- especially when paired with the pulled back hair. It also feels more like what a college student would wear (the bow in her hair contributes to this), rather than a professional woman. I’m not sure I agree that she an Meghan planned their outfits- first, their outfits are not very similar and secondly, that seems like an odd thing for two women in their mid-30’s to do. I thought, when compared, their outfits were striking because the styles were so different. As I mentioned above, Kate’s look felt very dated. I thought Meghan looked very chic- her coat and dress were different colors and the style felt very modern, especially when paired with those booties. It’s wonderful to see both duchesses out in their community! I don’t think this skirt is too short, to preempt what I expect some will say about this suit. What is off for me is the proportions of the suit itself, which I’m sure other more fashion-literate readers will be better able to iterate. In other news, I love the ribbon in the hair! So fun and girly. Greetings from a long-time reader and frightfully sparse commenter! Thank you so much for your timely post. This is a figure-flattering outfit on Kate, and certainly a look I’ve tried to copy within my slightly-more-limited budget. Her hair tied in a velvet ribbon is feels very contemporary and befitting a visit to a university. My more passionate comment is directly related to the comparison between the outfits of Meghan and Kate. I agree they coordinated, and my inclination is that they wore similar outfits in a way that strategically thwarts any upstaging of one another’s outings. Correct me if I’m wrong, but is this not one of the first (if not the first?) time they’ve had solo engagements on the same day? My hunch is that they coordinated fully aware that the boldest outfit is likely to garner the most media coverage. Dressing in tandem conveys collaboration in a way that denotes equal importance to both events and issues. I applaud this lovely display of unity! I think you’re so right about the avoidance of upstaging. It seems also like Kate could be wearing repeats to keep some spotlight on Meghan as she steps out in these early first months of her royal career. It’s such a supportive gesture towards each other in what could be a lonely role to play. I quite like the ponytail with a velvet ribbon, it’s a nice change of pace. I also agree that Kate and Meghan planned their outfits today – Meghan’s dress looks like it could have been borrowed straight from Kate – and I think it’s very clever of them. I can’t believe Kate brought this suit back yet again. She must really like it. I guess. Personally, I think the suit is showing its age and needs to be retired aside from its other drawbacks. The material looks faded, fuzzed and shrunken. The jacket is too tight across the chest and the skirt seems to be even shorter than in previous appearances. I have more criticisms to make but will refrain because I like Kate and everyone’s allowed to have a bad hair day, a lousy suit day or whatever today was. The earrings were pretty. Both of the duchess’s look lovely today. But I must disagree on two points. Firstly I don’t believe that Meghan’s outfit is burgundy at all. I think it clearly looks purple in the pictures. And secondly it would not take coordination to wear dark hose in winter. I myself do that. As well as most of the women I know. Just as in summertime we wear light hose.